The black B6 Omnidirectional Lavalier Microphone, Standard Sensitivity, with Hardwired TA5F Connector for Lectrosonics Wireless Transmitters from Countryman is a very small lav microphone measuring one tenth of an inch in diameter with changeable protective caps, which provide moisture resistance and color options. The mic can be used to capture audio for theater, broadcast, churches, and general lavalier applications. Built with a low handling noise and rugged construction, the B6 lavalier microphone can be easily hidden in hair or on costumes, or taped to a performer's face. The aramid cable and ultra-thin diaphragm deliver a natural sound while its tiny size makes the B6 easy to position for ambient noise and feedback rejection. The B6's cable terminates to a TA5F connector for direct connection to a Lectrosonics M185 or M187 wireless bodypack transmitter. 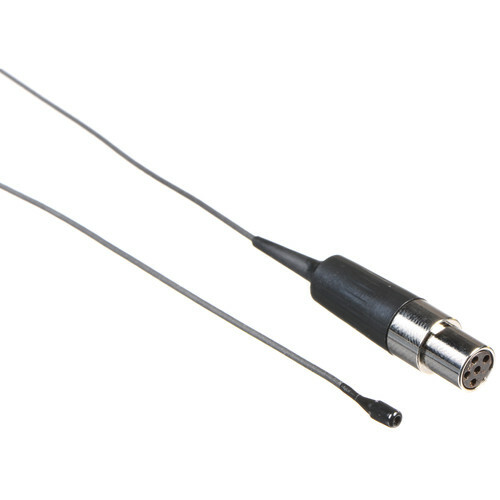 Box Dimensions (LxWxH) 9.3 x 5.1 x 1.6"
B6 Omni Lavalier Mic, Standard Sens, with Hardwired TA5F Connector for Lectrosonics Wireless Transmitters (Black) is rated 5.0 out of 5 by 4. Rated 5 out of 5 by SoCali Mixer from A great situational lav Its size make it a great choice when you need discreet mic placement. Often the head can be exposed and still be virtually invisible. The negative (fragile/easy to break) is also its greatest strength (so tiny and thin). Its a challenge if you feel you need to change out the response caps (maybe just for me?) but I'd give it 5 stars as a situational lav, not an every day lav.......... Oh yeah, sounds surprisingly good, too. Rated 5 out of 5 by Dan from Great mic, great solution. Great for hiding, especially with white or light colored shirts. Even when used visibly with a clip, it has a neat look. Sound quality is always good with the B6, especially in such a small package. Make sure you order the correct connector; no return, special order items are no fun tracking down refund/exchange options from Countryman. I wish Countryman made a nicer, more discrete mic clip. The cheap plastic ones are, well, plasticy and awkward looking. Can't find third-party clip for a cable that thin. Also, windscreen is off-white, not pure white. Still worthy of a five star rating. I often poke the mic through the button hole of a shirt, letting it stick out a little to avoid rustling. Most buttons are white so it's hardly visible at all. A little tape on the inside of the shirt and great audio is on the way. Rated 5 out of 5 by Missoula Mike from How we won the cold war Great sounding and incredibly invisible lav. I use it in docs for interviews or in narrative film for actors with tiny voices and wide shots where you can't get the boom close in. It is tiny, easy to hide and sounds quite good, especially combined with a pro wireless system like a Lectro. Rated 5 out of 5 by Anonymous from Very Happy My favorite choice for interviews and other controlled audio situations. The B6 sounds great and is the easiest mic to hide that I've ever worked with. I haven't seen one fail yet, but I wouldn't take it into extreme conditions expecting it to hold together.